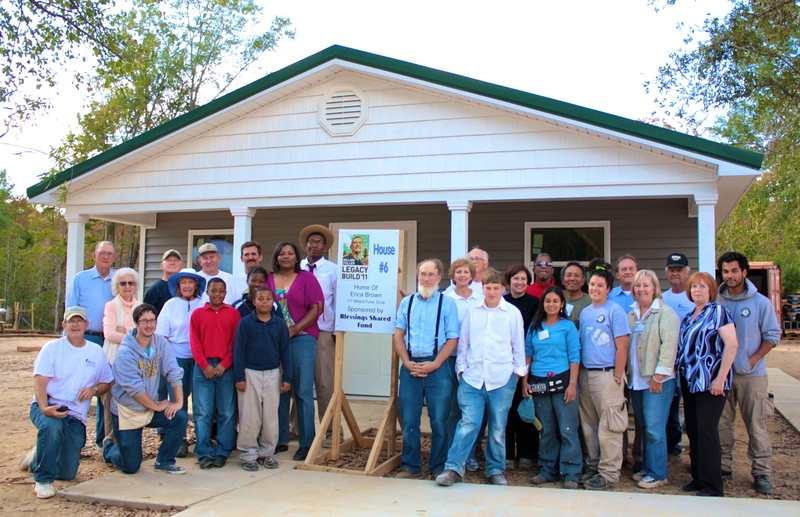 We’re back home after a great week at the Millard Fuller Legacy Build in Minden, Louisiana. Minden is a country town some 30 miles east of Shreveport. Charlie Park, who heads up the covenant partner there, came over to Shreveport to meet with Millard about the Fuller Center in 2006, and Webster Parish became one of our first partner organizations. Since then they’ve been hard at work in Minden and Spring Hill, getting God’s people into decent homes. This year’s event was a big one, with work on eight new homes and seven rehabs. We had an outstanding volunteer corps of some 250 hardy souls, some at their first build and many of the old faithful. Sheilla and I got to build this year, and it was great fun. I wasn’t sure I’d be able to crawl into bed on Monday night—we did a lot of lifting and toting that day. Things improved as the week went on and we were downright chipper by Thursday, when we had to say our goodbyes and go into Fuller Center board meetings. Our house leader was Orie Lehman, a good Amish man from Shipshewana, Indiana. He and his son Michael took the train down to Longview, Texas and a bus from there to Shreveport—a long, hard trip. Orie is a master craftsman with a seemingly endless reservoir of patience. He taught us all a great deal, managed to be in several places at one time, and made the build productive and great fun. I’ll be looking to Orie to lead my house from here on out. Our homeowner, Erica, was on-site all week. She works nights at a nursing home and days on the house. I’m not sure when she slept. Her son Shawn, her brother and nephew helped as well. It was a great joy to spend time with the family that will live in this house. Erica was paying close attention—it was like having the building inspector on the work crew! But she was gracious and welcomed us into her new home. Events like this are powerful. They call attention to the need for decent housing and highlight our approach to providing it. They inspire our donors and motivate our volunteers. But mostly they are an expression of the great human quality of coming together to do something good. Spending a week pounding nails with a couple hundred like-minded souls is a great reminder of the inherent goodness of humankind. Check out more blogs, news stories, photos and videos from the build last week!